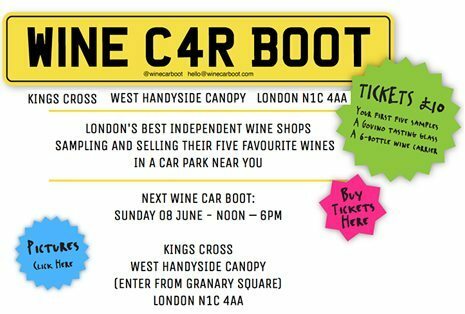 Just a quick note to say that we will be taking part in the W1NE C4R B00T sale this coming Sunday alongside London’s other bricks n’ mortar independent wine merchants. ‘Taste your way out of the supermarket“. There will be great food on hand; oysters and langoustine from Wright Bros, super burgers from Steak & Honour, all sorts of grilled cheese delights from Morty & Bob’s toasties, as well as the Fundi wood fired pizza. At only £10 tickets are available via the organiser’s website and include five free samples, a wine bottle carrier and an outdoor Govino tasting glass (or bring your own). We will also be selling wines by the glass and the bottle and have our own supply of ‘Bags for Life’ on-hand (which give you a discount in any of our shops). You can find our 5 selected wines for the day here and also the link to buy advance tickets – which are also available on the door. Obviously this event isn’t for everyone, but if you do know someone who might enjoy it, please pass on the word and tell them to come and visit us at our stand (van).